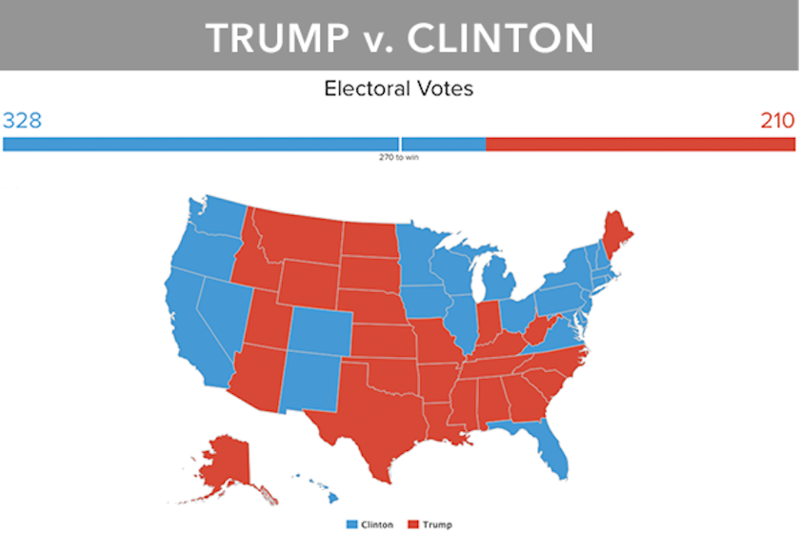 A new Electoral College projection Wednesday from Morning Consult found that Hillary Clinton would secure massive victories in the general election against both Donald Trump and Ted Cruz, the two most likely Republican presidential nominees. But the analysis also showed that Clinton, the former secretary of state and Democratic frontrunner, would suffer a defeat at the hands of John Kasich, the Ohio governor. The study, which surveyed more than 44,000 registered voters across all 50 states, showed that Clinton would have the advantage in nearly every Midwestern swing state against Trump, the GOP frontrunner, and Cruz, the Texas senator nipping at his heels. However, the analysis suggested that Kasich has the potential to flip the script in those states. The study showed Kasich holding leads in Pennsylvania, Ohio, Michigan, Wisconsin, and Minnesota, all states that his fellow remaining Republicans were projected to lose at this point. Kasich picked up momentum last month with a win in his home state's primary. But he has no chance to accumulate enough delegates to clinch the nomination before the convention, so he's banking that he can win a floor fight. Kasich's rivals are growing increasingly frustrated with his presence in the race — Trump said he would "automatically win" if Kasich dropped out of the race. Those who talk up Kasich say he is a successful governor of a swing state with a record to point to and clear bipartisan appeal. He also has abundant experience from nearly two decades in Congress, including foreign-policy areas and his time as chair of the US House budget committee. But that same bipartisan brand has hurt Kasich with the GOP base. He is to the left of most GOP candidates on immigration reform, and he expanded the federal Medicaid program under the Affordable Care Act — two issues that could doom him with hard-line conservatives. Sanders had perhaps the best single day of his campaign late last month, romping to landslide victories in Alaska, Hawaii, and Washington. He has won five of the past six Democratic contests. Still, he faces challenging odds — he needs to win about 57% of the remaining pledged delegates to overtake Clinton in the delegate count. Moving forward, the map doesn't look especially favorable: About 65% of the remaining delegates come from large states like California, New York, Pennsylvania, New Jersey, and Maryland. Cruz looks positioned to take down Trump in Wisconsin. After that, the map gets more challenging. Late April is dominated by Northeast and mid-Atlantic contests more favorable to Trump — including delegate-rich New York, where polls have showed Trump above 50% in the state. And his eye-popping fund-raising numbers mean he could be in the race for the long haul — perhaps all the way to the convention. Trump has lit the political world on fire since his entry into the race last summer, and he has showed surprising staying power. We're now on month No. 11 of "The Trump Show." He has won a majority of contests so far, a feat unthinkable when he entered the race in June. And he appears poised to at least go into the convention with the most delegates of any Republican candidate. There's a clear appetite among Republican primary voters for someone like Trump, who entered the race to controversy surrounding his position on illegal immigration. Business Insider discovered more of that when we followed him on the trail for a week last year. The delegate math is on Clinton's side going forward, even as she faces a potential loss in Wisconsin and a fight with Sanders in her adopted home state of New York. The long-presumed Democratic nominee, Clinton has been a shakier-than-expected candidate. But she has a clear look at the nomination, and she would enter the general election with a slight advantage over Trump or Cruz. "I'm not going to be responding to him," Clinton said in an interview with Business Insider last week. "I have pretty thick skin. I've been in the arena a long time, and that means that I am not going to get down with him and go insult for insult." Check out that full interview here. Morning Consult, a polling, consulting, and technology firm, surveyed the more than 44,000 voters in all 50 states over a four-month period. The company combined those results with other factors like voter demographics and economic data to forecast an overall outcome in each state. 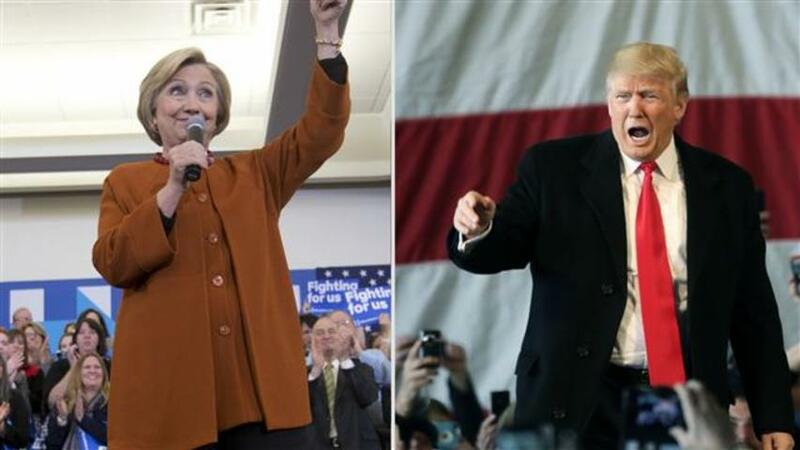 Clinton would edge out Trump and Cruz by more than 100 electoral votes, the analysis found. A candidate needs to secure 270 electoral votes to win the presidency. Of note, roughly 18% of total respondents were still undecided. Nine states, which will likely be among the most hotly contested in the potential Trump-Clinton matchup, are currently within the margin of error — Pennsylvania, Ohio, Michigan, Florida, New Mexico, Nevada, New Hampshire, Indiana, and Maine. Cruz's map against Clinton sets up in a near-identical way to Trump's, but the margins within several states are vastly different. Kasich's theoretical map would be a dream GOP scenario, with nearly every swing state going in favor of the Ohio governor.